Instagram contests are a great way to generate more followers and drive more engagement within your network of Instagram Fans. But depending on the type of business you have, what time of the year it is, and what your marketing objectives are, different types of Instagram hashtag contests will make sense for different types of companies. That’s why we’ve compiled 5 different Instagram contest strategy ideas with examples to help you get started. Positioning your Instagram hashtag contest around an event is a great way to create a buzz around the event itself as well collect user generated content related to the event for future usage. Popular Instagram hashtag contest event types include marathons, Christmas markets, New Year's parties, elections, store launches, and many more. Take a look at this example of an Instagram hashtag contest put on by the clothing brand Canada Goose at the 2015 Sundance Film Festival. Within their contest they asked participants at the film festival to upload an Instagram photo tagged with #AskAnyoneWhoKnows inside a giant snow globe that they had set up inside of the festival. By running this Instagram contest, Canada Goose was able to make their mark at the Sundance festival and collect a ton of user engagement around their brand. Just as the United States Post Office operates “Neither snow nor rain nor heat nor gloom of night”, your Instagram hashtag contest can run in any condition, at any time of year. In fact, you can even use the weather to your advantage when creating your Instagram hashtag contest. The clothing company Helly Hanson did a great job of this when they ran their Instagram hashtag contest called #WELOVERAIN. The #WELOVERAIN campaign was based around embracing the outdoors and all that entails. They asked their users to upload an Instagram photo of themselves enjoying the outdoors with the #WELOVERAIN for a chance to win a trip to Norway. By running this Instagram contest, Helly Hanson was able to generate over 370 entries and was able to stay top of mind for consumers coming into the rainy season. Your fans love your brand. So why not let one of them become your next brand ambassador? Instagram is a great platform to allow users to easily submit photos that are in alignment with your company’s core values and beliefs. 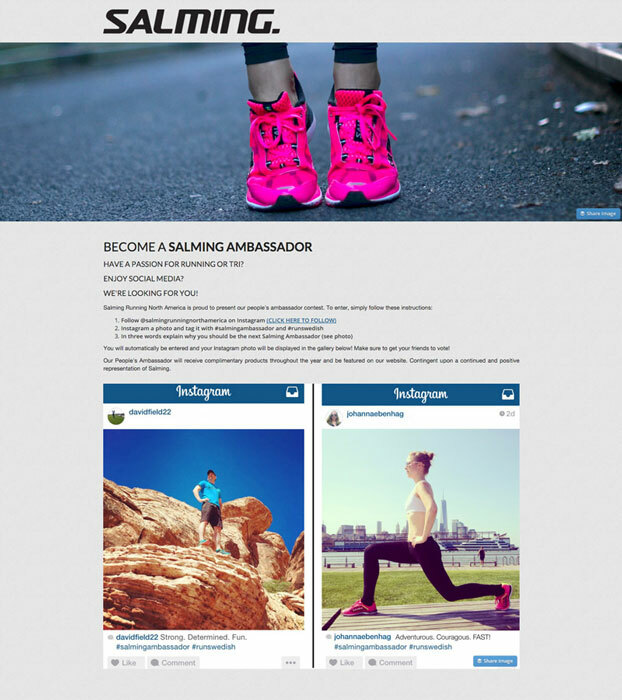 The sporting company Salming ran an Instagram hashtag contest aimed at finding their next brand ambassador. They asked users to tag a photo of themselves with the hashtag #salmingambassador along with three words that describe why they’d make the perfect ambassador. The result of this Instagram contest? A ton of user engagement, and a brand new Salmang brand ambassador. Instagram contests don’t just need to be about submitting photos of people. Use the platform to collect entries for design, illustration, and photography contests as well. The creative agency Midzai Creative held a Instagram contest giving away over $1000 in prizes to users submitting their best designs while using the #mindzaicontest. 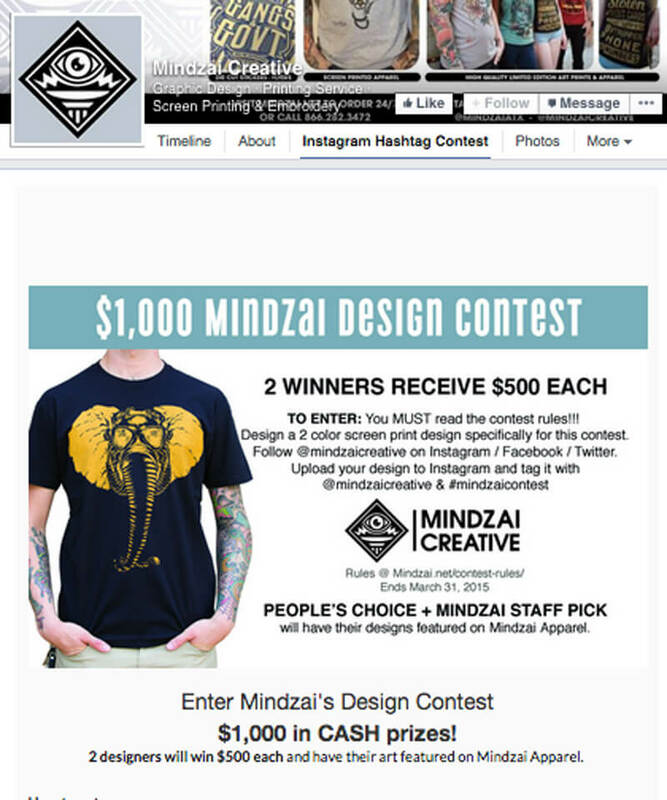 The result was a successful contest and a gallery of user generated content centered around the Mindazi brand. 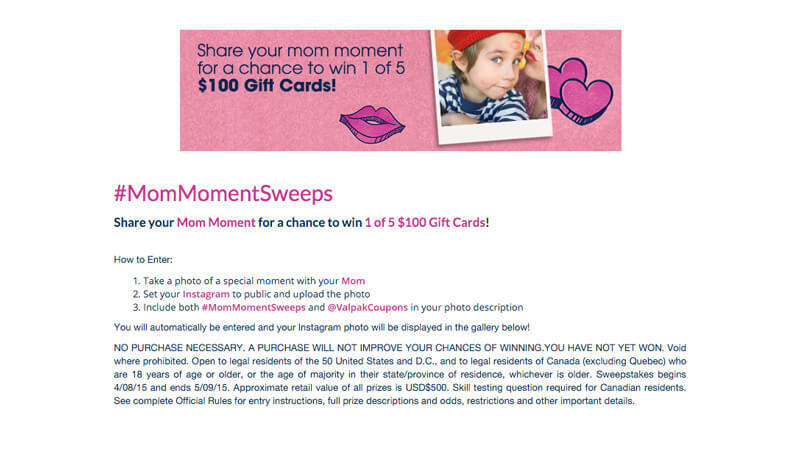 Valpak coupons ran an Instagram hashtag contest where they asked users to upload a photo of themselves and their mom and tag the photo #MomMomentsSweeps. This contest is a great example of how you can create an Instagram contest based around almost anything. Other great examples of this type of contest could include Fathers day, anniversaries, photos with friends, and photos with pets. Running this simple contest Valpak was able to generate over 700 unique entries and a whole lot of fan engagement. There you have it! 5 Instagram contests to inspire your next Instagram marketing campaign. As you saw, Instagram contests don’t have to be fancy, and they don’t have to be based around a big holiday, season, or event. Get creative and allow users to share what matters to them. This could be things like artwork, photos with friends, or pictures doing things that they love. Want even more Instagram contest inspiration? Check out some of the articles below!